On February 24th, President Obama signed into law the Trade Facilitation and Trade Enforcement Act of 2015 which now officially prohibits the importation of goods produced by forced labor or child labor, closing an 86 year old loophole and reauthorizing the Customs and Border Protection Agency to seize any imports suspected of being produced by forced labor. The International Labor Organization estimates forced labor fuels $51 billion a year in profits in international trade and more than 14 million people worldwide work as a result of force, fraud or deception in homes, factories, mines, and farms. “If the US government works to really keep out goods made with forced labor, this change will have a profound ripple effect on supply chains worldwide,” said David Abramowitz, vice president of Humanity United and a major advocate of the Act. 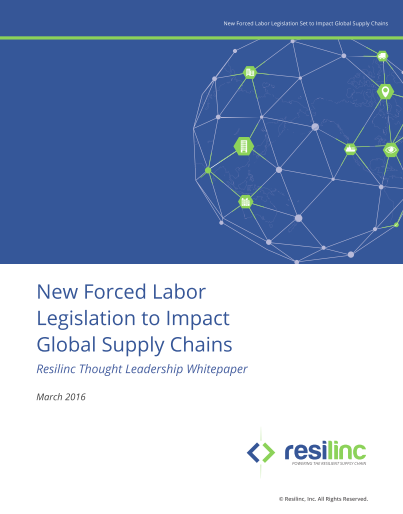 Resilinc has released a new report entitled "New Forced Labor Legislation to Impact Global Supply Chains" which, in concurrence that forced labor produced goods are common across industries and that the new law can significantly impact global trade, examines forced labor hidden in the supply chain as a palpable, three-pronged risk to companies, irrespective of industry or company size. These include business continuity risk, brand risk, and compliance/legal risk. The report concludes that it is critically important not to think about supply chain risks in isolation.